In close collaboration of some 60 years with our factories, JMT has fine-tuned the SBT series shears to the pinnacle of their design. Consider this; The SBT series shears offer one quarter inch to three quartet inch thickness capacity in 10 foot 2 inches to 13 foot 4 inches width capacities. The SBT series shear are just the most heavily built swing beam shears you can find in the industry bar none. With the most robust beam and frame construction available. They have a proven reliably designed frame with the most ridged beam possible. Why all this fuss? In order to provide the longest lasting most accurate swing beam shear, JMT has been relentless in the improvement of these shears to the point where no other supplier can come close to our accuracy and longevity. The shears are engineered to have the most optimized cutting angle which provides the least distortion when cutting the widest variety of materials. In addition to the optimized cutting angle the SBT series shears have been constructed with oversized bearings and box style swing beam which provides a constant blade gap over the full cutting length contributing to straighter cuts. A quick-set single point blade gap adjustment is conveniently located on the side frame of the machine. The operator can easily and quickly change this setting as the material type and thickness demands, for a high quality blank. The integrated back gauge can swing away at the end of its travel to allow the shearing of unlimited length drop pieces. Also available is a swing up style, which swings up and out of the way when the back gauge reaches the end of its range. Both styles allow shearing sheets of an unlimited length. To assist in loading the shear and setting up the cutting job the first 39″ of the finger guard can be flipped up out of the way for easy viewing of the work piece. Hold downs are provided to ensure that the plate is held firmly along the length of the cutting area. The hold downs are distributed in such a way that more are closer at each end of the table. This guarantees not only safer operation, at the beginning and end of the cut, but also the accuracy for narrow (short) plates at each end of the machine. Each independently acting hold down is capable of applying high pressure to hold the material to assist in accurate cutting and a straight piece part. Standard features abound on this style of shear. JMT-USA is providing a shear that has more standard features than any supplier in our marketplace. These standard features reads like a wish list for the “perfect shear.” Included in the standard features is possibly the most important feature there is. The base of this shear in manufactured from ST-44 steel, stresses relieved via atmospheric gas furnace, then fully machined in a 5 axis milling machine, to insure accurate, exact joining points for further build quality. The JMT-USA SBT series shear also comes standard with the D-Touch 7 C-N-C touch screen control. This control has a large 7 inch screen display which allows for rapid data input, easy communication via USB port for flash memory, and an Ethernet RJ-45 140/100 M capability. This D-Touch 7 C-N-C controller also allows for unlimited operator programming steps as well as unlimited material types. Also incorporated into the SBT series shear are easy blade gap adjustment, ball transfer front tables, a 39 inch ball screw back gauge with automatic swing up, a 59 inch squaring arm with scales “T’ slots and a tilting stop. As if this wasn’t enough the shear also comes with shadow line illumination, 39 inch flip up finger guards which come in handy for first cut verification which would then be placed in the down position for increased operator safety. Numerous pressure assisted hold downs, and a position anywhere operators foot pedal. 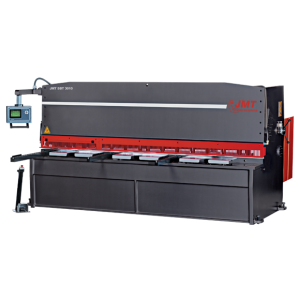 Options available for the JMT-USA SBT series shear include the availability of; higher strokes per minute speed, motorizes blade gap adjustment, laser line, light curtains for safety, hydraulic “anti-twist” device just to name a few. To customize your new JMT-USA SBT shear to exactly fit your own operational needs, please contact your Regional Sales Manager who is highly skilled in applications of these shears to production and would be happy to assist in your application.